BMW’s sleek, high-powered M6 gets a facelift for 2016, making its first appearance just ahead of the North American International Auto Show in Detroit with refreshed styling and updated features. As with the standard 6 Series, the 2016 BMW M6 lineup will come in three body styles: two-door coupe, convertible, and four-door Gran Coupe. Also like its 6 Series counterparts, the 2016 BMW M6 gets a revised version of BMW’s signature kidney grille, which uses nine vertical bars on each side instead of ten, which BMW says makes for better aerodynamics, and in turn, better fuel economy. Visually, the M6 is set apart from the rest of the 6 Series with a unique front grille treatment, larger front air intakes, different side mirrors, aggressive side skirts, BMW’s signature M side gills and M-specific wheels. New adaptive LED headlights come standard on all models. Coupes and convertibles get forged 19-inch light-alloy wheels, while the M6 Gran Coupe rolls on 20-inch wheels. 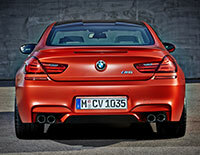 In the rear, the M6 features a rear bumper with integrated diffuser and quad exhaust pipes. The Coupe and Gran Coupe also get a carbon fiber roof to reduce weight and lower the vehicle’s center of gravity for optimal performance. The 2016 M6 lineup will continue to use the 4.4-liter turbocharged V8, good for 560 horsepower and 500 pound-feet of torque, the latter of which is available as low as 1500 rpm. As before, power is sent to the rear wheels via a 6-speed manual or a 7-speed double clutch transmission. With the dual-clutch, the M6 coupe and Gran Coupe can rocket from 0-62 mph in just 4.2 seconds (4.3 seconds for the M6 convertible). In the cabin, the M6 gets an enhanced iDrive display and center console in a black panel design, as well as a standard, M-specific head-up display. Drivers can also control their own GoPro cameras directly from the display using the GoPro app, included with BMW’s ConnectedDrive suite of applications. As before, the M6 includes a leather M sport steering wheel, M gear lever, a unique instrument cluster and signature M contrast stitching on the seats, dash and doors. A broader range of optional color schemes, both inside and out, are new for 2016, including Jatoba Brown exterior paint and Aragon full merino leather interior. Buyers can customize any M6 even further via BMW’s Individual program. 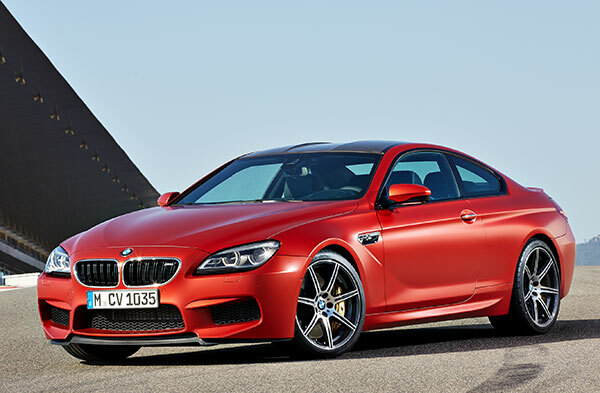 The 2016 BMW M6 lineup is expected to go on sale in the U.S. in the second quarter of 2015. Pricing hasn’t been announced, but we expect a modest price bump over the previous model, starting at around $118,000 for the M6 Gran Coupe.